A Presta valve is a long, thin stem often found on the tires of high-end bikes. These valves work with a manual lock nut, as opposed the spring found on the traditional Schrader valve. Bike stores sell air pumps that can fit both valve styles or just one valve type. 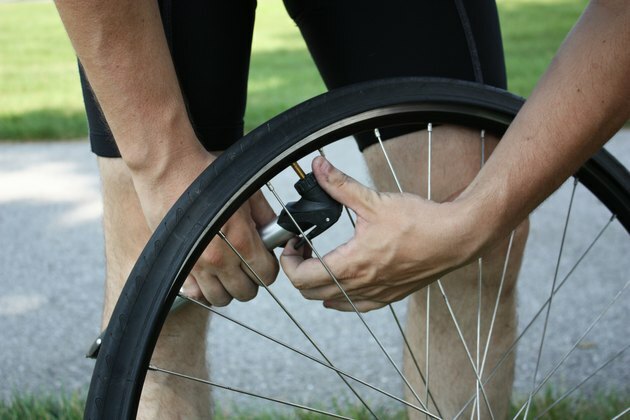 Inflating a tire with a Presta valve is similar to the inflation method for a Schrader valve, but it does require a specially designed nozzle on the pump. If your pump does not have a Presta valve nozzle, you can buy an adapter from your local bike shop for just a few dollars. Remove the black cap from the Presta valve stem. Turn the lock nut on top of the stem counterclockwise until it is loose enough to allow airflow. If you push down on the top of the nut and hear air escaping, the nut is in the correct position. If necessary, screw the adapter onto the valve stem. If your pump has a lever to hold the valve, flip it down. Insert the Presta valve stem into the hole on the nozzle. If necessary, flip the lever on the pump up to hold the valve stem into place. Pump the air until the tire is properly inflated. Change the nozzle lever to the down position if necessary and pull up to remove the pump from the valve stem. Turn the lock nut clockwise to seal it and replace the cap. Each style and brand of tire needs a different amount of pressure to avoid flats. The ideal pressure range will be stamped on the sidewall of your tires. Always check this range before inflating your tires.